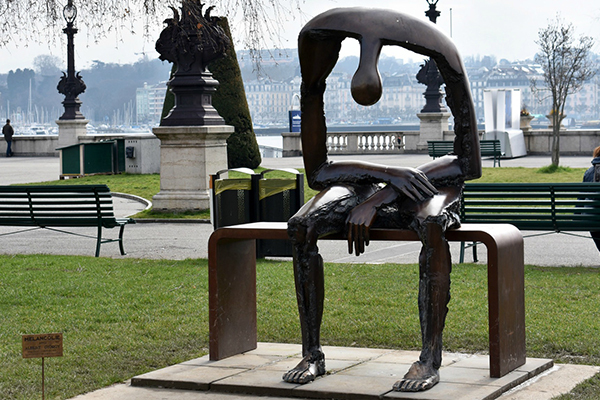 Melancholy, a sculpture created by Albert Gyorgy, portrays the void that grief leaves us with. The sculpture depicts a figure made of copper sitting on a bench slumped over, with a giant hole in the center of it. This hole represents the massive void that we all feel when we lose someone dear to us, and many people have expressed their appreciation for this sculpture for it portraying the exact emotions they feel, but perhaps haven’t been able to quite put into words. Albert Gyorgy felt intense sadness and isolation with the loss of his wife and went on to create this beautiful piece of artwork as a way to cope. A photo of this sculpture has been shared on Facebook over 200,000 times by various people who’ve suffered a loss in their life. Strangers have united to share their unfortunate experiences with loss, and have expressed words of sympathy to one another. . Many people feel they can relate to this piece of artwork in various ways, through grief, but also through mental illness. The void in this art can represent a multitude of emotions that we all face. It is relatable as we have all likely felt lost and empty at some point in our lives, and it brings people together knowing they’re not facing these hardships alone. As dark as this artwork may be, it serves as some sort of comfort to those who’ve experienced a loss, as they feel they identify with this sculpture. This famous sculpture can be found at Lake Geneva, Switzerland, and proves to be a popular tourist attraction. If you find yourself on a European vacation, consider paying a visit to this beautiful sculpture and grasping the deep meaning it portrays. See the original Facebook post here.